Mothers are special because they know exactly what to do in any situation, and perhaps more importantly, what not to do in certain situations. Unfortunately, mothers in today’s working world are not treated with the amount of respect they deserve. Working moms are often pigeon-holed into individual contributor roles because of their need to take time off for maternity leaves and adjust normal working hours to balance being a mother and worker – leading to a gap in advancement opportunities. However, research indicates that having women in leadership positions can increase productivity, spur innovation and improve decision-making processes. Recruiters need to be mindful of the value working mothers bring to companies and understand what working moms are looking for in new roles. Mothers expect to be treated fairly in their job searches and have come to expect organizations to offer competitive wages and flexible schedules. Mothers are valuable assets to any organization. Yet, women are still paid roughly 80 cents to every dollar a man makes. Because of this staggering gap, the Pew Research Center also cites about 27 percent of women say their gender has made it harder for them to succeed – citing gender wage gaps and less leadership/growth opportunities. As the gender pay gap continues to make headlines this year, the topic is top-of-mind for all women looking for new positions. This is especially true for working moms. Working mothers purportedly feel more stress when job seeking for fear of being “passed” on a job offer due to their role as a mother and the daunting feeling that they are being paid less. Women often feel being a mother limits their opportunities in recruitment conversations far too often, or, immediately lowers their pay scale. They aren’t wrong. The New York Times has reported that full-time working women who have children are paid 15 to 20 percent less than their male counterparts. To set your company apart and stand out as a differentiator in the corporate world, make your company’s stance known on the gender pay gap. Put to ease the minds of female workers who are interested in your brand; let them know they are encouraged to apply because they have an equal shot at any position a man has – and they’ll be compensated fairly for their individual skills and experiences. According to iCIMS’ Women in the Workforce Report, aside from salary, female office professionals consider schedule flexibility and work/life balance to be among the top incentives when accepting a job. Working moms have skills that translate to every aspect of their lives, but their busy schedules can sometimes get in the way of a regimented work schedule. However, as the world continues to make innovative strides in technology, working flex-hours and telecommuting have become increasingly popular. As a result, companies are loosening the reigns on a strict, company-wide schedule. “I am responsible for ensuring that our products meet the necessary specifications from both a company standpoint and for our customers. On top of that I need to make sure I’m keeping my team happy and fulfilled as well as keeping my boss satisfied with the work that we’re producing. Being skilled at multitasking has helped me get further in my career and continues to help me daily”. Your business risks being poorly-staffed when it hinders the candidate pipeline by ignoring talented working moms. To stay competitive, recruiters must focus on the needs of their talent pools. 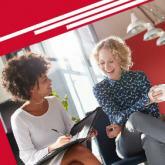 Talk to your business leaders about the importance of communicating equal pay and flexible schedules toward prospective employees. To leverage additional tools to make complex recruiting easier, check out “Recruiting is Complex: 5 Tools You’ll Need to Make it Easier”.